Lately, I have been craving salads and bread. I am not sure if the bread cravings are those needed carbs to stay warm in the winter (I am always cold in the winter, no matter how many layers I am wearing). I don't usually start craving lighter meals until the weather starts warming up. Who knows. Since I am a salad lover, I am always on the look out for different ideas. 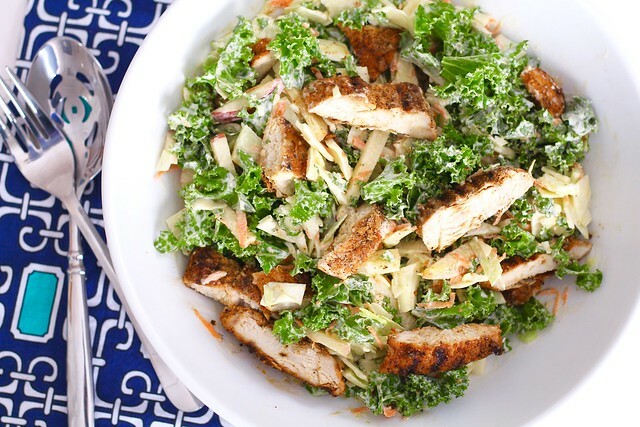 Chicken is definitely one of my favorite additions to a salad. 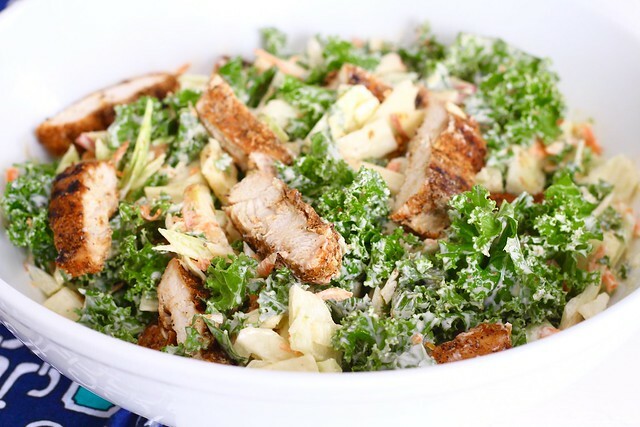 It is an easy to way to turn a boring, not so filling salad, to an exciting, satisfying meal! It makes for a great lunch, or a delicious, light dinner. For the record, I am not a cole slaw fan. At all. So, at first, I was a little hesitant to try this recipe. 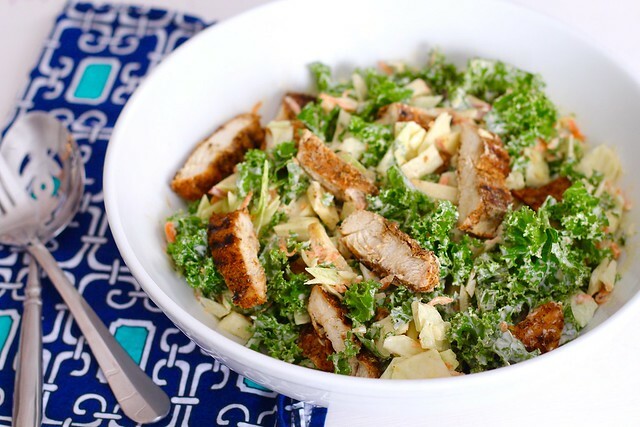 But, I love kale, and I love chicken, so I thought I'd give it a try. Boy, I am so glad I did! I couldn't stop talking about how great it was over dinner. The flavors are bold, but not overpowering. The yogurt makes the perfect amount of tang. And the spice-rubbed chicken takes the cake. Putting together all those flavors is like a giant party in your mouth. I couldn't wait to eat this for lunch the next day. It would also be fabulous cold, in a wrap. A perfect lunch to take to work/school! I can't wait to make this again. Rub the chicken breasts with olive oil. In a small bowl, whisk together the salt, pepper, cumin, chili powder and lemon zest. Rub both sides of the chicken breasts evenly with all of the spice mixture. Preheat a grill or grill pan over medium-high heat. Cook the chicken for 10-15 minutes on each side, or until the internal temperature reaches at least 160˚F. Transfer the cooked breasts to a cutting board and let cool for a few minutes before slicing. For the dressing, whisk together all of the ingredients in a small bowl or liquid measuring cup. Set aside. In a large bowl, massage the kale using your fingertips, with the 2 teaspoons oil, until the leaves have softened, 2-4 minutes. If that isn't enough oil, add 1-2 more teaspoons. Mix in the cabbage, apples and carrots. Pour the dressing over the top and toss until everything is coated. Place the sliced chicken breasts over the top and serve.